Sado Tempest is a radical retelling of Shakespeare's 'Tempest', fusing Noh theatre, Taiko drumming and Japanese rock. 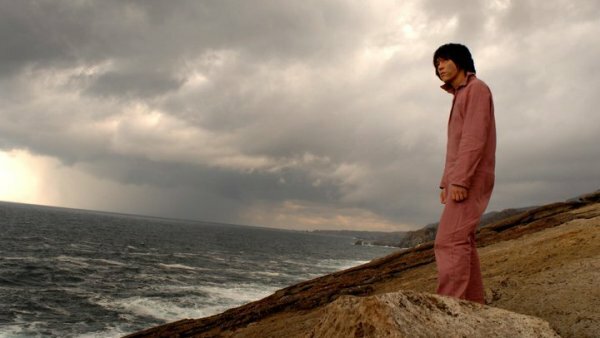 Japan, the near future; rebel rock star, Jun Tokushima is exiled to the bleak prison island of Sado, which has fallen into permanent winter after a terrible storm. At first he tries to escape, but there is no way off the island. His only hope seems to lie in the strange, ancient songs of the Demons that once lived there, but the Demons have all disappeared. Jun has to break the code of the songs, and free the Demons, in order to bring Spring back into the world. John Williams was born in the UK, grew up in Wales and studied French and German literature at Cambridge, where he began to make films. After teaching in a secondary school in London for a couple of years he moved to Japan in 1988, and continued to make independent films, before writing, producing and directing his first feature: the multiple award-winning, Firefly Dreams (Ichiban Utsukushi Natsu, 2001), which won him a nomination for Best Newcomer Japanese Director by the Japanese director's guild. Since then he has been involved as producer or co-producer on several short films, documentaries and features and directed Starfish Hotel (2007) with some of Japan's top stars, including Koichi Sato, Tae Kimura and Akira Emoto. Sado Tempest is his third Japanese language feature film. He is currently developing an English language film set in Thailand and two more Japanese feature films. When I first visited Sado Island in 2008 I was immediately struck by parallels with Shakespeare's Tempest. Sado was the island of exile for rebels and also has a strange primeval forest in its centre. The island is full of "strange sounds and music": Demon Dances and drumming, a primitive festival with traces of Noh theater in the Demon masks. I began to imagine a hybrid version of The Tempest; a weird blend of Japanese culture, old and new, and the bones of the play itself, transformed by a storm that has gone terribly wrong, trying to find its way back to some kind of new spring. Ultimately, what started as a metaphor for the state of Japanese society and the effects of the long depression turned into something completely different as a result of the tragedy that started on March 11th 2011, just three days into our shoot.